“America’s Diplomats”, a 2016 documentary produced by the Foreign Policy Association, may come at just the right time with just the right message. In some ways, the hour-long film blends the literature of American diplomacy, such as Shuster’s The Strangling of Persia, Kennan’s Memoirs, and Holbrooke’s To End a War, with more recent insiders’ views, like Kopp and Gillespie’s Career Diplomacy, Morgan and Kennedy’s American Diplomats, and AFSA’s Inside a U.S. Embassy. 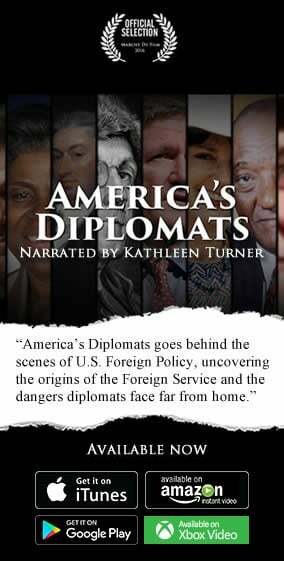 The film introduces the history of American diplomacy, well-known and less familiar personal stories, and challenges to the Foreign Service and its work. While much of the media attention on U.S. foreign policy and the Department of State today focuses on failures, scandals, or intra-agency turf battles, this film reminds us that the career personnel are talented, dedicated people whose commitment to public service and American interests includes considerable sacrifice. “America’s Diplomats” begins with this focus on danger and sacrifice. The famous attacks on U.S. diplomats in Iran, Lebanon, Kenya and Tanzania, Benghazi and elsewhere are dramatic and tragic. But many diplomats and their relatives have also been lost to crime, disease, ship wrecks and other events in the course of their duties. The danger to diplomats has resulted in many changes to U.S. embassies and consulates, such as turning many into “fortresses” in the world’s capitals. From here,”America’s Diplomats” begins its chronological and thematic sections. Benjamin Franklin went to France to help secure American independence. A quest for safety and prosperity, often through isolationism, characterized much of the diplomacy of the next hundred years. Global changes in politics, technology, and economics in the last part of the 19th century and especially after World War I required changes to American diplomacy and to the American diplomatic corps. A key was the 1924 Rogers Act, which sought to introduce more professionalism and meritocracy to the State Department. Kennan’s Long Telegram and Holbrooke’s shuttle diplomacy will be familiar to many viewers. But the consular side, which often touches Americans and others more directly than treaties or doctrines, is also highlighted. The work of Hiram “Harry” Bingham, consular officer in Marseilles during World War II, alludes perhaps unintentionally to current issues. Bingham is credited with saving thousands of Jewish and non-Jewish refugees, issuing visas more generously than official policy allowed. It cost him his career. Seven decades later, his story was revealed when hidden documents were found in his home. He was honored posthumously by organizations as diverse as the United Nations, Yad Vashem Museum in Jerusalem, the U.S. Episcopal Church, and Secretary of State Colin Powell. Bingham was even put on a U.S. postage stamp, as a Distinguished American Diplomat. “America’s Diplomats” then transitions to contemporary challenges, reflecting recent changes in global politics, technology, and economics. The expansion of global trade and finance since the 1980s called for an increase in economic diplomacy. The 1987 Montreal Protocol on ozone-damaging CFCs serves as a model, the film argues, for multilateralism and environmental diplomacy. The IT revolution of the past 30 years, in particular the growth of the internet has called for new kinds of public diplomacy. The film concludes with concern over the increase in the number of political appointees to ambassador posts, but the benefits of attracting more diverse and mature Foreign Service Officers to meet the new challenges. These new challenges are one area in which the film might have gone into more depth. The State Department tweets in 11 languages, and many embassies use Twitter, Facebook, and YouTube in their local languages. How effective is this? How do we know? More broadly, how is the Foreign Service dealing with the huge range of non-state actors that have become so important in recent decades? And how does it balance its promotion of democracy, religious freedom, and human development (economic, education, health, etc.) with more “realist” state-vs.-state views of national interest. For more information, please visit the America’s Diplomats website.